Trying to convince naysayers that it’s serious about Google App Engine as a bona fide business, Google(s goog) on Thursday put a price plan around its MySQL-based Cloud SQL services. There will be two options. One is what Google calls a true per user price model to help get people started and in which they incur query charges only when they are actively using the service although the storage meter keeps running throughout. This model targets users with lightweight applications and/or those with unknown spiky workloads who don’t want to have to predict their usage in advance, said Joe Faith, product manager for Google Cloud SQL. The second package billing plan allocates a designated amount of RAM and CPU for a monthly fee based on the number of days the database exists. Queries that access RAM but not disk are not charged for I/Os. Package charges start at $1.46 per day for 850K I/Os per day, 1 GB included storage and 0.5G RAM. At the high end, the charge is $11.71 per day for 8M I/Os per day, 10GB storage and 4GB RAM with two tiers in between. Both plans also incur a network charge of $0.12 per GB for outbound traffic. Google published the price list Thursday with billing slated to start in 30 days. Cloud vendors are competing fiercely on database services. Two days ago, Amazon(s amzn) brought Microsoft SQL Server (s msft) into its Relational Database Service (RDS), which already offers Oracle(s orcl) and MySQL databases as managed services. The newly available beta of HP’s Cloud Services(s hpq) also offer MySQL database services. “Cloud SQL was one of the most requested additions to App Engine ince it launched, poeple wanted a SQL option to go with our NoSQL option,” Faith said in an interview this week. 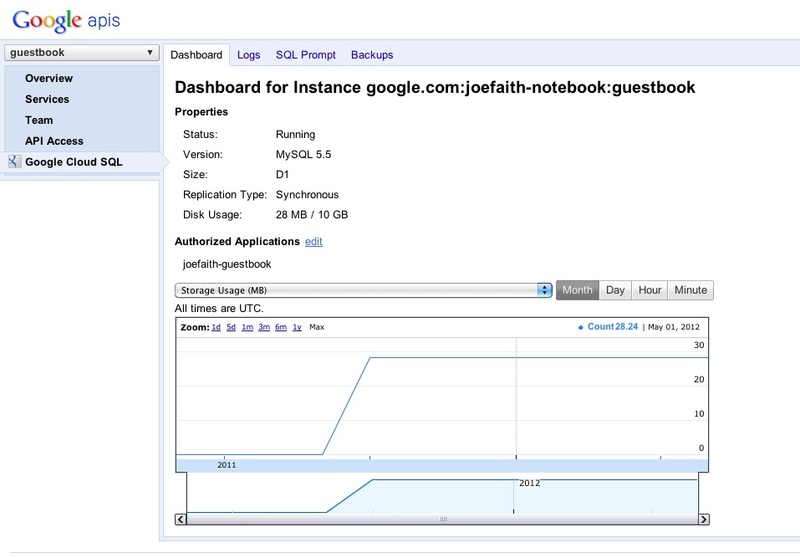 Google made an early version of Cloud SQL. available in October and has since signed up 10,000 users for it, he said. Google is clearly still smarting from criticism, including some in GigaOM, that it’s not serious about Google App Engine as a business. Critics have taken to painting Google as an advertising company not a technology provider and the company is fighting that perception. If scaling with MySQL becomes an issue for you, check us out @ http://www.nuodb.com. Cloudbees provides way better options than google app engine in terms of price, database and java compatibility. wew… MySQL now goes to cloud…. Everything is on cloud now, after cloud hosting now everyone can have their MySQL Cloud. Technology is being so modern now….